This statement is disarmingly earnest or (perhaps falsely) naïve and is a happy surprise. The charm of the grammar runs into the strangeness of the “trying, but authoring, at least,” as if trying & authoring were opposed or mutually exclusive. Frank pleads for credit, to be acknowledged as the zero point of origin of the text. 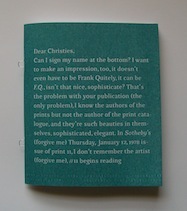 Frank wants his name branded on the little poems that describe the content of the catalogue. The content of the catalogue is kind of subjective; Frank sees the texts as primary in opposition to the intent of the catalogue itself. 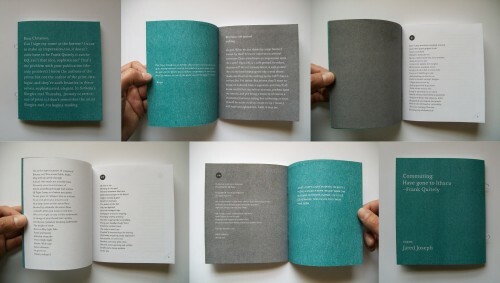 The book begins with an eager close reading of another unnamed author’s print title that leaves the impression of the reader enraptured by the text, the catalogue of secret poetry, which becomes the poetry of secret pictures. The object is absent, as in any text that doesn’t exclusively refer to itself. The straying from the constraint of fictionalized catalogue descriptions is a clinamen like rupture that animates the work with a kind of generosity, frankness, all the more convincing because of the layers of disguise. The book consists of fifteen poems and a glossary of terms plus the cover letter. The work moves in and out of the print catalogue diction, fiction, foxing, flashing, lithogiraffe, and lioncut, verso, recto, etc. punning loose, and alluding freely in a sort of mood that’s gleefully inappropriate for a very serious auction catalogue. This is a kind of relief, to hide with glitter some sadness and a panic of death and the name of god. The content veers between details of Frank’s life his difficulty representing, the pictures that he is supposed to be describing. While the possibility and difficulty of meaning is well-trod poetic turf, Frank quietly also considers the way that art must be approached and described, in order to be a marketable commodity. An artist who is not The Artist must describe the work for this economy. This strategy makes things seem fresh, re-interesting, the act of authoring these descriptions doesn’t feel hollow or hermetic. Here’s an admission of fiction. The text admits itself as fiction and admits to the fiction of the author. Are none of them prints or are none of them “fine” prints? Or is this the “fine print” that there never was a print? The prints are a fiction in the mind of Frank, even if they are not “insculped” into the reality of Frank. The character Frank is further disrupted by the entry of the names of Yosef and Jared Joseph in the text. As when other Author’s use their names as an important part of the text (like Nick Demske) it adds another level of character, dissociated from Author. Frank Quitely becomes even weirder and I think Borgesian object (there is a Borges epigraph.) In the tangle of character and identity Frank Quitely emerges as a cipher for the things that might be unsayable. The prints (poems) are titled melancholically. The threat of the print’s being entirely fictional, even inside the fiction, lends them a kind of tragicomic quality: “Buoy”, “Are you my Mother”, “S’assourdir” (to dim, deafen, become voiceless), “Don’t touch me don’t kiss me” point toward a kind of personal intimacy while the Borges, Kabbalism, mysticism, and self-reflexivity, redirect to an outside or other kind of reality, driving the reader into recursion, a labyrinthine distraction towards something very strange and very familiar.